We have found several carries like Verizon, AT&T, and others around the world moving towards a 5G NR and a full 5G system. 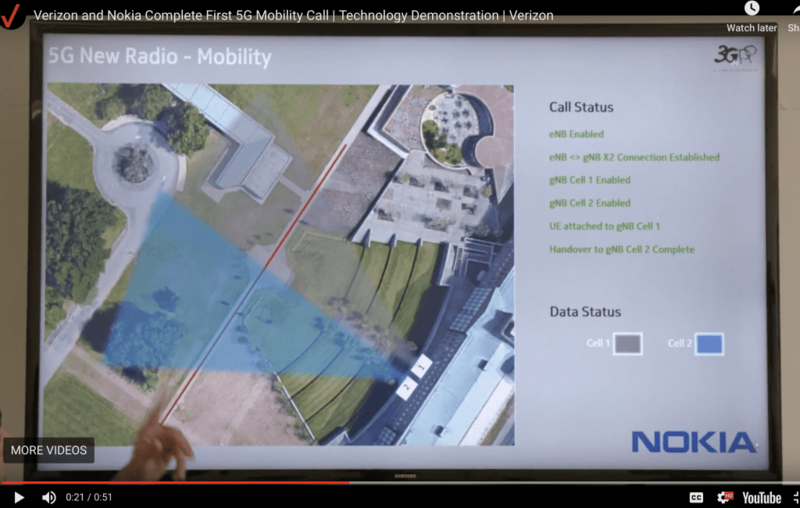 In this video, Verizon says “it made history” with the first 5G NR Handover powered by NOKIA. The test conducted by Verizon shows how, two 5G sector are positioned and how handover occurs between sectors using a minivan for the demonstration (at 00:22-00:25). In the figure below, you can observe that Verizon has two sectors in blue and gray. As shown, the van travels thru the sectors and performs a X2 handover between the two cells, UE or mobile is first attached to Cell 1 and then hands off to Cell 2. Additionally, 5G is being tested, validated, and getting to roll it out, including devices with a “5G Testbed” platform with Verizon Wireless. V5G emulation with USRPs or software-defined radios to validate fading, errors, and other real-time radio conditions. According to this roadmap, in 2017 it was achieved MIMO testing with 4×4 arrays. As shown at 1:22 an emulated 5G Server is placed in the network and via USRPs, testing conditions are emulated in connection with the UE or Phone. In this example, Xn Handover could be tested using two V5G emulated eNB with what appears to be a realistic 5G ENB, where the RF signals are then mixed or added UL/DL in a 2×2 example. Packet Distribution Functions are observed at 2:29 of the video, clearly depicting statistical data for all packets been exchanged between simulated or emulated eNB and UEs. As shown in 2:39, the system changes values of Signal strength in all the channels emulated, as shown in dBm, described as BRS Power Received Power in the video frame. Finally at 3:59, we can observe that throughput can be scalable from 5Gbps to 10Gbps. Hence we have observed how VERIZON is partnering with NOKIA for their 5G Deployment and COBHAM for emulation of 5G networks. Verizon is testing and partnering with 5G Testbeds to emulate their network performance and test before deploying, incising efficiency and coverage.